In this iPage review, We are going to cover some important areas of iPage hosting. This in-depth review will help you to understand iPage web hosting in a better way. Read our iPage hosting review and decide yourself if iPage hosting is good fit for you. iPage was founded in 1998 in Boston, MA. They have grown as the most successful and economical web hosting companies. Their hosting platform powers over 1 million websites. iPage is owned by Endurance International Group, which is the owner of top companies like BlueHost, HostGator, and Constant Contact. iPage offer an affordable web hosting services to make your business or idea online, quickly and easily. Their web hosting services are Shared hosting, WordPress hosting, VPS hosting and Dedicated hosting. iPage shared hosting plan starts at $1.99 per month which is the cheapest web hosting plans among other web hosting providers. Read our in-depth iPage hosting review to decide if iPage hosting is right choice for you. In this iPage review, we have discussed about following areas. If you don’t want to read our in-depth iPage hosting review, click here to read iPage summary. What are the advantage and disadvantage of iPage? 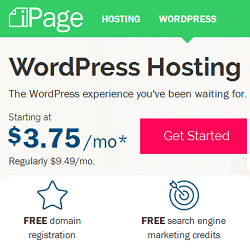 Why you should consider buying a hosting plan from iPage? Let’s discuss some points to understand it first. 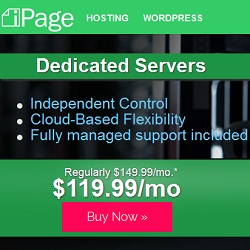 Low-Cost Web Hosting: iPage offers shared hosting at $1.99 per month which is the cheapest hosting plan. We have included iPage in our cheapest web hosting comparison so that you can decide for yourself. Free Domain Registration/Transfer: You can choose either free domain registration or free domain transfer while registering your account with iPage. Free SSL Certificate: iPage offers free Let’s Encrypt SSL for your domain. Host Unlimited Domains: You can host unlimited websites on single account which cost you only $1.99 per month. $500 in Extras: You will get $200 worth of Free ad credits for search engines such as Google and Bing. $300 worth of free security tools, free website builders and free WordPress building tools. 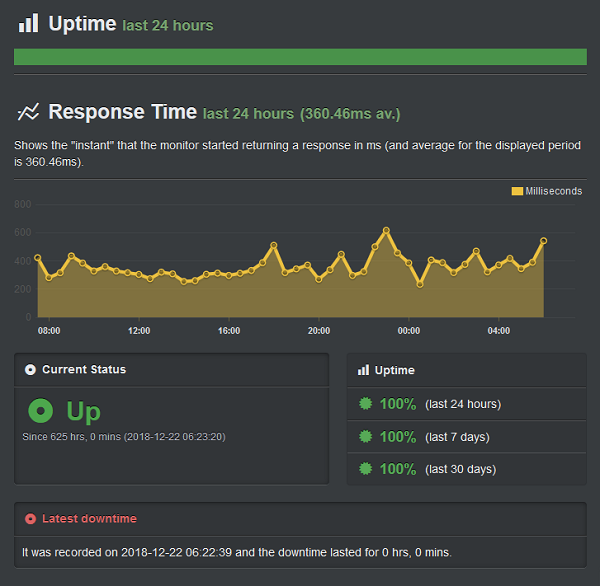 99.99% Uptime: iPage uptime is very solid. Your visitors will rarely face any downtime. 30-Day Money Back Guarantee: If you are not satisfied with iPage Hosting service, they will give you, your money back without asking any questions. They will refund your hosting fees during the first 30 days, refund is not applicable for add-on services, such as domains, Website Security, Site Backup & Restore, etc. No Monthly Billing: iPage do not offer monthly billing like HostGator. You have to buy a hosting package for minimum of 12 months. No Windows Servers: If you are planning to host a website on Windows Server, then iPage is not for you. They provide only Linux hosting servers. Website Uptime is very crucial for any business. If your website downs very frequently, you lose your trusted visitors that helps you to earn money. Here you can see the iPage Uptime status in below snapshot. We have recorded 100% Uptime in last 30 days (Dec’18) which is great for any website. Checkout the 12 months Uptime and Response time shown in below table. Average iPage Uptime was 99.97% and response time was 787 ms.
iPage offers different web hosting services like Shared hosting, WordPress hosting, VPS hosting and Dedicated hosting. iPage hosting do not offer any coupon code. You can click here to get 75% instant discount from iPage web hosting. You will get the shared hosting plan at $1.99 per month. iPage Shared Hosting: Shared hosting is the basic hosting services provided by iPage. Shared hosting is good for beginners and the people who want to start a small blog or website. Checkout our in-depth article of iPage shared hosting. Following are the key features of shared hosting. Many people think that expecting good customer support from low cost hosting provider is a myth. But iPage hosting proved it that low cost service providers can also offer great 24/7 customer service. If you have any query, you can head to their Knowledge Base or Chat or Call to get the quick support. Their knowledge base is just like step-by-step guide with necessary snapshots. iPage is the cheapest and reliable web hosting provider with a solid Uptime history. You can host more than one website with iPage and get FREE domain registration, FREE domain transfer, FREE SSL Certificate, FREE drag and drop site builder, FREE 24/7 support, 30-day money back guarantee and much more. Overall, I found iPage is good for you, If you have a small website or just want to start your blogging career. 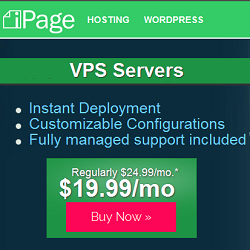 You can buy web hosting plan from iPage in just $1.99 per month. When you buy a hosting plan from iPage, do not forget to uncheck aggressive up-selling add-on plans. One last thing to summarize, there is no comparison of iPage with BlueHost and SiteGround. If you are looking for #1 and highly recommended WordPress hosting provider, you should go with either BlueHost or SiteGround. If you have purchased a iPage hosting plan, share your iPage review in comment section. This will help other readers to know about iPage hosting. If you have find our iPage review useful, don’t forget to share with others.